A utensil used for pulling the cork up and out from the opening of wine bottles. There are many varieties available, but four basic types are the most commonly used. 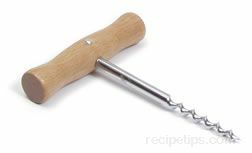 The simplest variety is a "T" shaped corkscrew containing a long sharp-pointed spiral wire or "worm" attached to a handle, which is perpendicular to the worm. This handle is manually twisted, inserting the worm into the cork as it is pressed downward. With the use of some manual effort, the cork is released and removed from the bottle. A second version is a double-lever corkscrew made with a center turning handle connected to the wire worm that is geared into two extractor levers. The wire worm is positioned on the head of the cork as the handle is manually twisted, inserting the worm downward into the cork. As the worm moves down into the the body of the cork, the extractor gears raise the levers upward, positioning them so that they can then be manually brought downward, bringing the cork up and out of the bottle. The effort required with this type of corkscrew is minimal. A third type is an automated version of the T-shaped or double-lever corkscrew. This type has three levers, consisting of two horizontal rubber-surfaced lever clamps that gently secure the neck of the bottle while a top clamp controlling the worm wire is placed on the head of the cork. As the top lever is gently brought down on the cork, the worm mechanism twists the wire worm, inserting it cleanly into the cork with a minimum amount of pressure. The top lever is then manually raised while securely holding the neck of the bottle, allowing the cork to be removed easily. The fourth type of corkscrew uses friction to remove the cork and isn't a corkscrew at all but considered simply a cork remover. It consists of a handle holding two thin, stiff, but flexible wire prongs of metal that are spaced evenly apart about the width of the wine bottle mouth. The prongs are inserted along the edges of the cork and into the bottle by rocking the wires back and forth gently in a downward motion. This procedure requires some trial and error, which may result in a cork being inadvertently pushed down into the bottle, but once mastered will allow a cork to be removed without creating a hole in the cork. It is the friction between the prongs and the cork that allows the cork to held between the prongs as it is drawn up and out of the bottle. This process may require some twisting of the cork to release it from around the inside edges of the bottle as it is held between the wire prongs, but it can be accomplished easily once it is practiced.